NaNoWriMo starts in 2 days…I’m really getting nervous and excited! I’ve hooked up with a very nice group of fellow “Rhinos” (Dallas/Ft. Worth area NaNo participants) for some “prep-ins”. I’m hoping to visit them again for some “write-ins” over the next month. I also attended the kick-off party in Ft. Worth this past weekend and met some more wonderful fellow participants. We played a pretty fun genre-writing game together and I got some swag (score!). I’ve finally got a basic plot and an outline of my main characters. I also put together a sample book cover for my upcoming bestselling novel. I’ve also purchased a new notebook computer (squee!) and downloaded yWriter software to help me organize things. Now…I’m visiting family out-of-town for the first week of the event. Still, I should have time to get my word count quotas in while my wife, sister-in-law, and brother-in-law play WoW. 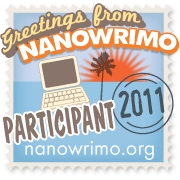 This entry was posted in Ramblings and tagged nanowrimo, writing. Bookmark the permalink. Hi! I went to the kickoff party too! Which group were you in? Were you in the sci-fi? or the biker bar and cupcakes group? LOL Cant wait to meet more people! I was in the fantasy group (grime-fighting unicorn and fairy duo takes on vampire-goblins with fixation on being glittery like Edward Cullen…). I was the confused-looking guy with a cowboy hat. Lots of fun had by all!